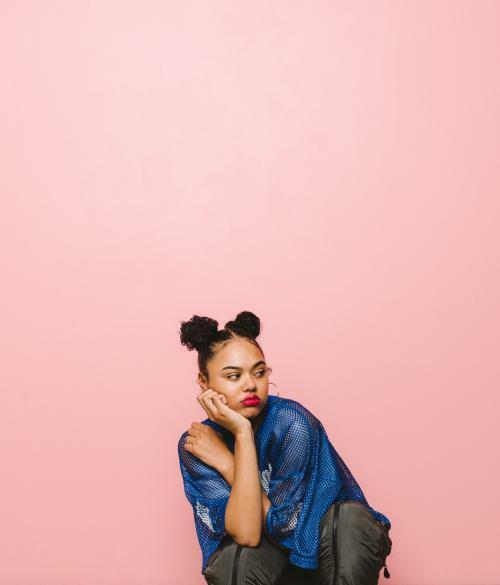 On Samaria’s latest single, “Foolish,” she makes a bold proclamation of self-awareness: “Get my s**t together, just to f**kin’ lose it,” she coos. “I’m foolish.” At 22, the singer/songwriter has lived many lives within two short decades, documenting her journey through song along the way. As she readies her upcoming mixtape, Adventures Of Lovergirl, along with her debut album, Samaria is finally geared to share her story with the world. “My family always said I was 13 going on 37,” she says with a laugh. “I was a very emotional kid, but rough around the edges.” Born in Oakland, Samaria divided her time between both her mother’s and father’s homes, often moving around with her mother who was an aspiring singer. “I love where I’m from,” she says of the Bay Area. “I honestly believe the Bay cultivated a lot of who I am as a person: my tomboy style, my lingo, how I write my music.” She attended school in the prestigious Berkeley thanks to using her grandmother’s address as she lived out of zone, and was known as the smart student who was always in hot water. “I had this sass to me,” she recalls. “I was always in the principal’s office. I was always in trouble, but I was a kid who was a little too wise beyond her years.” A fan of ‘90s R&B (thanks to long road trips with her mom), Samaria took in the classic New Jack Swing Era while listening to modern-day heroines like Keyshia Cole. From writing fairytales to filling journals with stories and poetry, Samaria penned one of her first songs at 11 about a boy she had a crush on who always dyed his hair. “The song was called ‘Fire Head,’” she says. “Mind you I never really ever had a conversation with him.” Her maternal grandmother was her biggest cheerleader in music, often providing musical incentives like instruments and music lessons for good grades. However, at 14, Samaria lost her grandmother to Multiple System Atrophy. “I was heartbroken,” Samaria says of the loss. “I went through a depression and kind of stopped showing up to school.” By 16, she returned to a career in music, the goal her grandmother had always encouraged her to pursue. “I knew she believed in me. I wanted her to be proud of me.” Samaria dropped her first song over SoundCloud while still in school and was met with praise from her peers. She kept the momentum going after high school. 2016 was a monumental year for Samaria. A then unsigned artist, she released her debut EP, The Story Of Right Now, a project that centered around a key relationship in her life. The project arrived with a short film and was followed by a collaboration with Kehlani on the intoxicating “Love Me Crazy.” Critical acclaim flooded in, though the fate of Samaria’s career was still hanging in the balance. Praise doesn’t pay the bills. “I just wasn’t sure what I was doing with my life,” the siren admits. “I love music and wanted to do music, but just wasn’t sure if it was meant for me.” In addition, Samaria found herself creatively separating from her original team, looking for new faces to work with as both she and her sound matured. She spent the following year in uncertainty, though it ultimately proved to be a blessing.